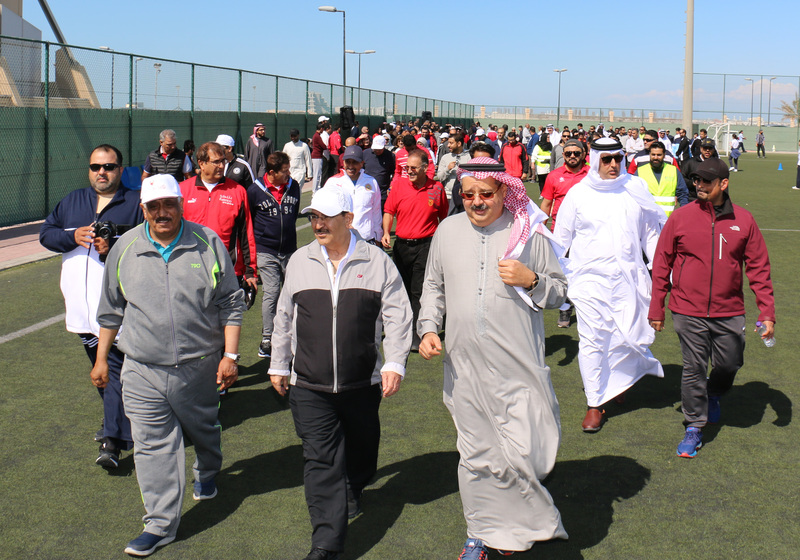 Electricity and Water Affairs Minister Minister Dr. Abdulhussain Mirza and Electricity and Water Authority Chief Executive Officer Sheikh Nawaf bin Ibrahim Al Khalifa, along with senior officials took part in the Bahrain Sports Day at the Al Najma Club Stadium. The minister said the Sports Day comes in line with the directives of His Royal Highness Prince Khalifa bin Salman Al Khalifa, the Prime Minister, to allocated half a working day to all employees of ministries and government agencies on this day to celebrate Bahrain Sports Day to promote the concept of sport for all and to realize awareness of the importance of sport and its role in the life of the individual and society. The minister praised the directives issued by His Royal Highness the Prime Minister, which came at the initiative of His Highness Sheikh Nasser bin Hamad Al Khalifa, the representative of His Majesty the King for Youth Affairs and Chairman of the Supreme Council for Youth and Sports. He said it contributes to raising awareness of the importance of practicing sports and celebrating the sports culture and health in the lives of citizens, and restoring the health of employees while reducing the phenomenon of absenteeism for health reasons. This increases the level of productivity and is an opportunity to create a healthy and friendly atmosphere between employees outside the workplace. The minister thanked the organizers and all the officials and staff who participated in this unique national event.